Many Czechs remember Cape Arkona, on the German island of Rugen (Slavic: Rujana), as a summer tourist destination, different from any other. The parking lot, the lighthouse, the remnants of a fortified settlement, the information sign, the refreshment stand, and for the older amongst them, the knowledge that it was the northernmost area of former East Germany, the last view of the high seas and beyond. And for that reason visitors will be surprised to see this place honourably depicted within The Slav Epic cycle. Among the places where, according to Alphonse Mucha, the key moments of the history of the Slavs unfolded. In Mucha’s time, the Arkona settlement had a mythical significance, symbolising proof of the original Slavic glory. Mucha chose to remember the cult of Slavic God Svantovit, brought about at the turn of the first and second millennia, spreading far beyond the Baltic island. On the top of a tall white cliff, a thousand years ago, a fortified settlement and Svantovit shrine stood. A bastion of Slavonic paganism, the last to resist Christianity, dedicated to the Slavic pagan god Svantovit. Every Autumn, pilgrims from across Europe traveled to the island in order to celebrate an annual harvest festival. Thus Arkona became the „Delphi“ of the North, over a thousand years ago.The festival was held each year by the Slavic peoples, to worship their god accompanied with a great feast and ritual sacrifice, games and dance. The famous temple is on the left-hand side of the scene. The brightest figure among the pilgrims in the foreground is the mother with the child, a symbol of Slavonic emotion behind which the sun sets. In the background an animal sacrifice to their God, then divided amongst the feast. And while in the bottom of the image carefree joy prevails; people celebrating and relaxing after harvest, the enemy sleeps and clouds gather above the pilgrims. In the top left corner of the canvas, Gemini God Thor, with a pack of dogs, can be seen, slowly overshadowing the sky, a precursor to the Arkona invasion. Unlike the celebrating Slavs, Thór and his men are fully armed. The main scene takes place in the centre of the picture. The Slavic man dies in front of the figure of Svantovit. But instead of depicting the God as a man with four faces or heads, as was chronicled, Mucha chose to represent Svantovit as a giant oak. The blue-and-white stream of light represents the warrior’s sword that the god uses to protect the future of the Slavs. Mucha’s concept of the original shrine differs to what is now known about it. 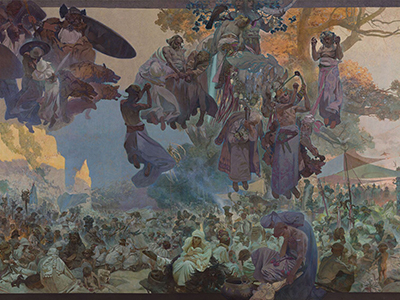 While the real sanctuary with the Svantovit statue was found in the middle of a well-fortified stronghold, Mucha placed the feast and shrine on the shore. Due to less being know about Slavic mythology at Mucha’s time, the artist had a free hand, able to interpret the events in his own way. Arkona and the The Svantovit Temple were destroyed in 1168 by the Danish King Valdemar I, the entire island being conquered. Thus the organised religious cult of the Slavs ceased to exist any longer. The sanctuary was plundered, the Svantovit wooden statue atop pulled down, burned and broken before the Slavs eyes. The pagan inhabitants of Rugen were then forcibly baptised. Little has survived from the original fortified settlement. Now Slavic Arkona stands only on canvas.